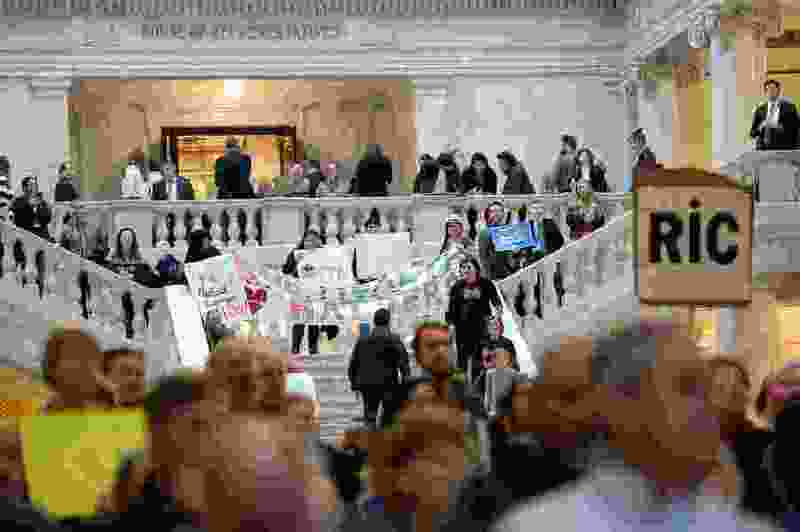 (Francisco Kjolseth | Tribune file photo) More than 300 demonstrators fill the Capitol rotunda on Jan. 28, 2019, on the first day of the Legislative session to rally in support of protecting Proposition 3, the Medicaid Expansion law recently passed by voters. The American Medical Association’s website points out that people without health insurance live sicker and die younger in the U.S. The AMA supports full Medicaid expansion and opposes punitive conditions like work requirements. So why is there deafening silence from the Utah Medical Association on this issue? Their leadership obsessed over Proposition 2, spending time and money to lobby for repeal and replacement. The UMA’s website and Twitter feed @Utahmed continue to highlight negative items about cannabis, but have zero posts about the Legislature’s rush to repeal Proposition 3. Medicaid expansion is critical to the health, longevity and economic security of low-income Utahns. By extension, it will benefit doctors and hospitals. Prop 3 repeal efforts are being driven entirely by rigid ideology, not facts. The SB96 repeal bill in particular is not just terrible policy, it is immoral and unjust. Speak up, UMA and medical professionals, before it is too late. Without Prop 3, more vulnerable Utahns — many of whom are children — will suffer and die unnecessarily due to lack of access to care.